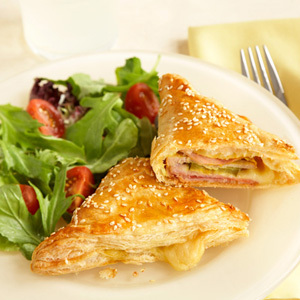 What makes these puff pastry turnovers Cuban? 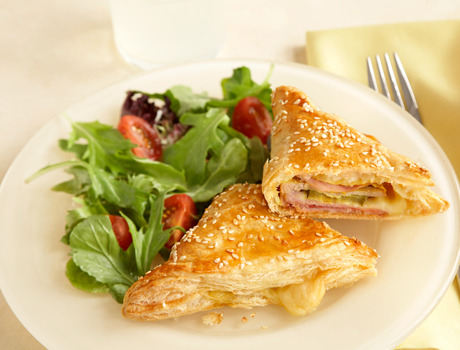 It's the tasty combination of ham, cheese and pork seasoned with mustard and pickles. Give these a try...they're really good. Heat the oven to 400°F. Stir the honey and water in a small bowl. Unfold the pastry sheet on a lightly floured surface. Roll the pastry sheet into a 12-inch square. Cut into 4 (6-inch) squares. Spread 1 teaspoon mustard on each pastry square to within 1/2 inch of the edge. Layer each with 2 ham slices, 2 cheese slices, 1 pickle slice and 2 pork slices. Brush the edges of the pastry squares with water. Fold the pastry over the filling to form a triangle and crimp with a fork to seal. Brush the filled pastries with the honey mixture. Sprinkle with the sesame seeds. Place the pastries onto a baking sheet. Bake for 20 minutes or until the pastries are golden brown. Let the pastries cool on the baking sheet on a wire rack for 5 minutes. Serving Suggestion: Serve with a green salad with sliced tomatoes, onions, radishes and a lemon vinaigrette.